YOUR HELP AND SUPPORT IS TRULY APPRECIATED! 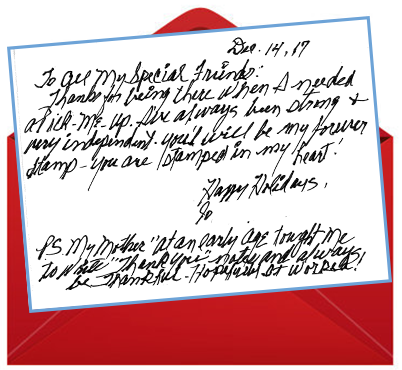 A client writes a thank you letter from the heart. Are you part of the 20-30% of Americans who regularly skip breakfast? Running out the door without a bite to eat may seem like an easy way to save a few minutes in the morning, but it could actually be affecting your health more than you know. Eating a healthy breakfast every day reduces your risk of type 2 diabetes by 21% and heart disease by 27%. 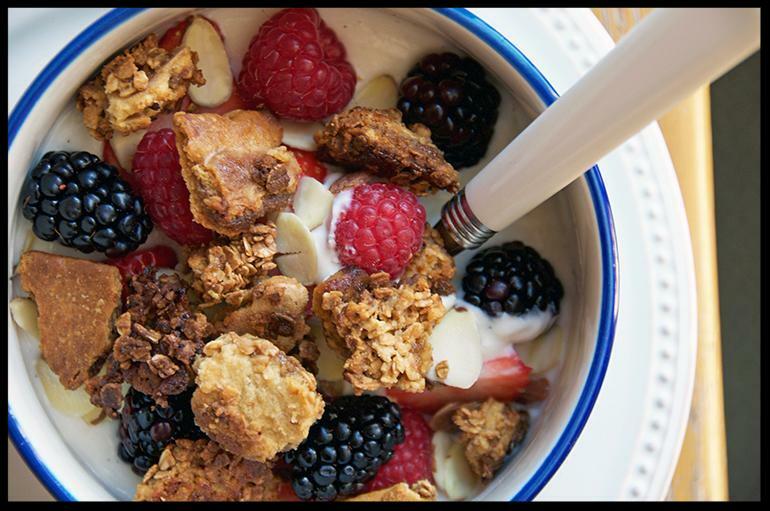 Keep your heart healthy and start your day off right with a nutritional breakfast! 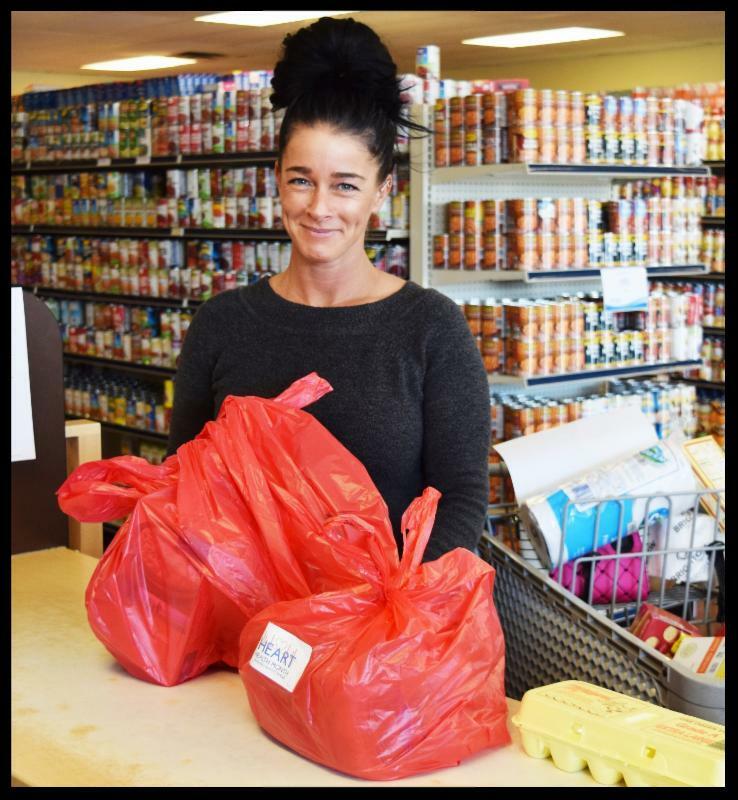 During the month of February, Frisco's only community Food Pantry provides each household with special red grocery bags filled with everything needed to prepare that week's featured meal. The red bags also contain facts and recipe cards to help further educate and promote healthier meal options. "The goal is to educate, support and supply the items needed to support each and every person to live a heart healthy lifestyle," said Keri Keck, Client Services Director. 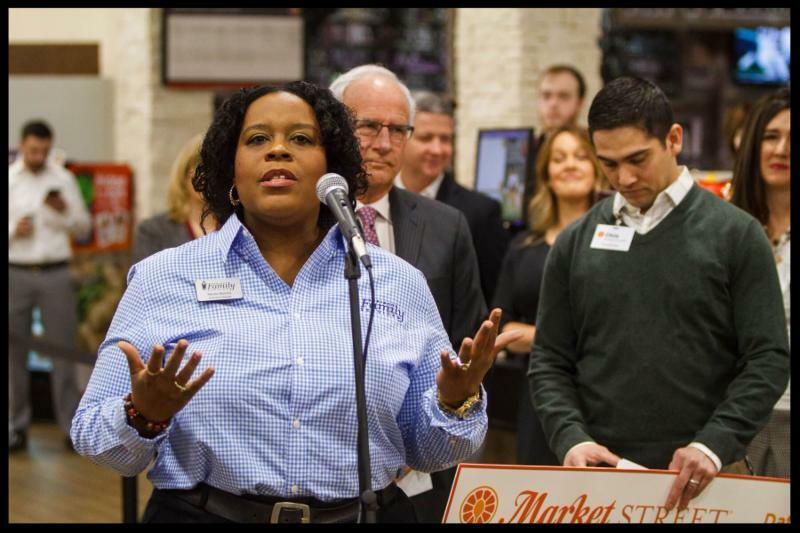 "One of the great things about our Food Pantry is that we offer a variety of different nutritious food options. Providing the red bags is just another way we can help our clients better plan for success." ﻿by donating to Frisco's only community Food Pantry. 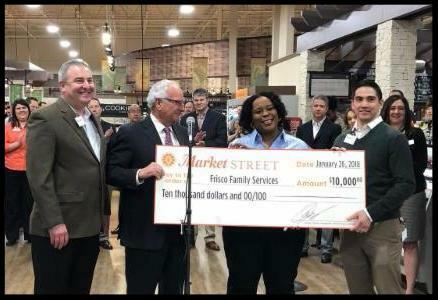 ﻿for their very generous donation to Frisco Family Services! Welcome to our very CARING community! 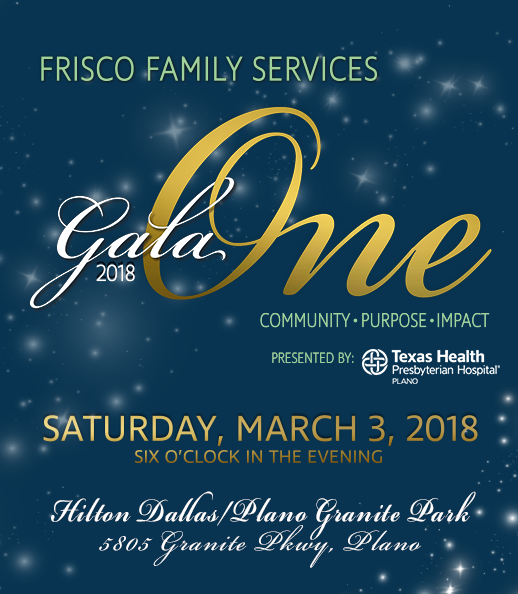 Frisco Family Services Gala 2018 - ONE will be held on Saturday , March 3, 2018 , at the elegant Hilton Dallas/Plano Granite Park hotel at 6 p.m.
Join us for an evening that will include tantalizing tastings , presented by some of the area's finest dining establishments, as well as live music from the Emerald City All-Stars , voted best live band in Dallas. An incredible live and silent auction that will present the opportunity to take home one-of-a-kind items and bid on unique travel experiences . Don't forget to purchase your Raffle Tickets before they sell out! Enter to win a $10,000 Visa Gift Card or a Lavish Hawaiian Getaway. You do not need to be present at Gala 2018 - ONE to win. ﻿There is no better time to give with your hearts! February 12-16 is Random Acts of Kindness Week and we're encouraging YOU to take it one step further! Show a little love for your community by volunteering at Frisco Family Services! 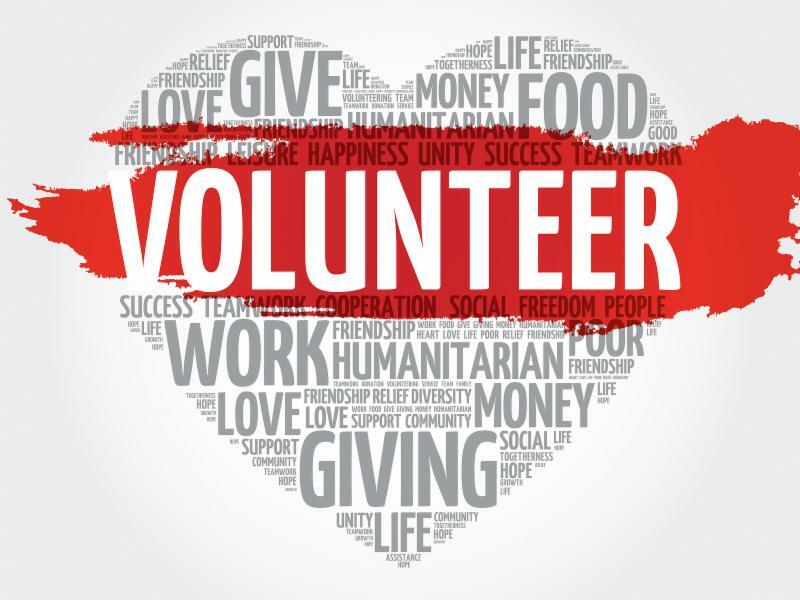 There are many different ways you can volunteer with us, from helping out at our Food Pantry, Frisco Resale and at our agency, to being a part of our Special Events. There is sure to be a position that is right for YOU! Current most-needed volunteer positions: Front Desk Reception, and Food Pantry Drivers for donation pick ups. to sign up to volunteer today! 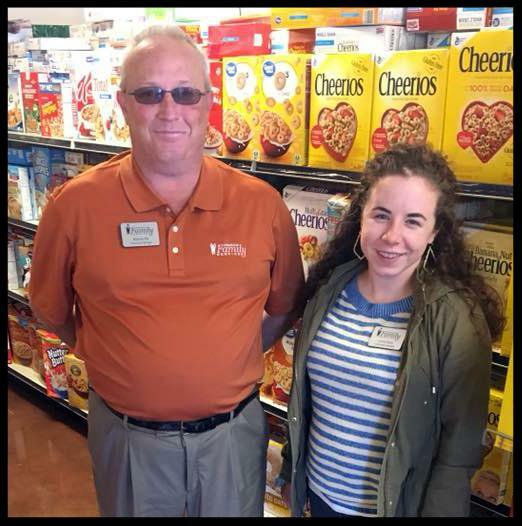 Managing Frisco’s only community Food Pantry appeals to Ronny because of his 25 years of retail experience, and because it allows him to see and hear the needs of the individuals and families we serve. After seeing how caring and helpful this community is, Ronny knows he is in the right place. Shortly after graduating from Baylor University with a masters in Social Work and Divinity, Lizzie joined the Frisco Family Services team in October to assist with our holiday programs. As a native to the area with a passion for helping others, and addressing food insecurity, Lizzie recently moved to the Food Pantry Assistant position. ﻿Friday, March 16, from 10 a.m. - 11 a.m. Interested in volunteering at Frisco Family Services? Join us on Friday, February 23, from 10 a.m. - 11 a.m. or Friday, March 16, from 10 a.m. - 11 a.m., for an informative session that will provide an overview of the agency, volunteer opportunities and a tour of Frisco's only community Food Pantry and Frisco Resale . No Paperwork necessary to attend this session. Please be sure to let us know if you plan on attending, and the date of the session you have chosen: February 23 or March 16. Contact: Elaine at volunteer@friscocenter.org or at (972) 335-9495. You make our community a better place.